These are definitions of terms often used in working with polymer clays. 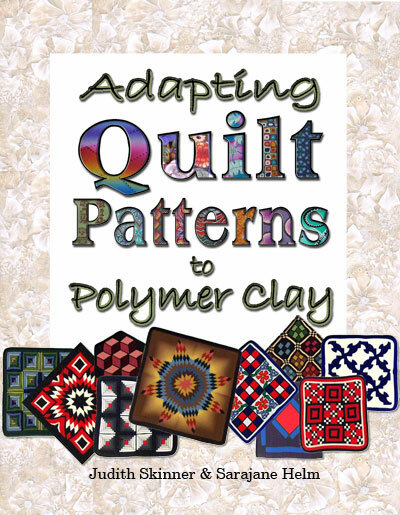 This glossary is taken from “Adapting Quilt Patterns To Polymer Clay” by Judith Skinner and Sarajane Helm, with thanks to Nan Roche, Barbara McGuire and Merriam-Webster. Armature – A skeleton or framework on which clay pieces are built to give support and reduce the amount of clay volume inside. Paper, wire, aluminum foil are some items used. Cane – A term borrowed from glass working that refers to patterned or solid colored rods placed to form a design. Slices of canes are used to create millefiore work. Conditioning – Preparation of clay before use to warm and soften it and align molecules for permanent strength. Cut-outs-Shapes made using cookie cutters or similar tools. Embossing powder – Acrylic particles used in stamping designs or as inclusions that react with heat to expand and become glossy. Extrusions – Shaped lengths of clay made using a tool that presses soft clay out through a disc (die) with a precisely cut opening. Grit – Degree of coarseness in sandpaper or powders; low numbers such as 60 are very coarse and range to superfine automotive grade at 1200 and 2000. Millefiore – Literally Italian for “thousand flowers”; refers to glass making technique that uses patterned and colored rods of glass to form canes, slices of which decorate objects like beads and paper weights. Morphing – The process of changing a component from one shape to another. It can also be done to a square cane to change the corners into the flat parts and the flat parts into corners. Pasta Machine – Roller device designed for making noodles, and used with polymer clay to condition, blend colors, texturize and create even sheets of clay of 7-9 variable thicknesses. Comes with hand crank and removable noodle cutters that will cut raw or cured into strips. A motor is also available. Photocopy Transfer – Technique that uses the plasticisers in polymer clays to transfer ink from photocopied images onto the clay. 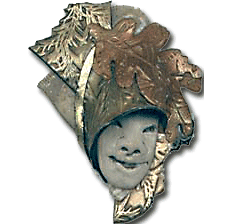 Liquid clays form soft peel-off sheets that contain the image after baking and can be appliquéd and rebaked. PolyVinyl Chloride – Known as PVC; a white, water insoluable, thermoplastic resin used in making record albums, plumbing pipes and polymer clays. Reduction – Squeezing and compressing the cane in on itself as the cane is also stretched to lengthen it causes the scale of the design to become smaller. This can be done a little, or a lot. Sheets – Flat, even layers of clay, made by rolling the clay with an acrylic rod, a brayer, or a pasta machine. Slamming – Forcefully throwing the cane down on a flat surface to help “wake up” canes that are slow to move. Also refers to the process of putting canes together quickly or within a group caning process. Snakes – Rolled out pieces of clay that are long with a round diameter. Also referred to by other shapes as in “triangle”, “teardrop” or “square” snakes. Strips – Clay pieces not as wide as tongues that can easily be formed by flattening a snake of clay by pressing with your thumb or a roller to flatten onto the work surface. Thermoplastics – Polymers that once formed can be heated and reformed over and over again. Thermosets – Polymers that are formed and then heat cured into a permanent shape. Varathane – Line of wood finishing products made by Rust-Oleum; the water based indoor version is compatible with polymer clay as is the water based spray. Wedges – Components shaped like triangle snakes but are cut at an angle from sheets of stacked clay.